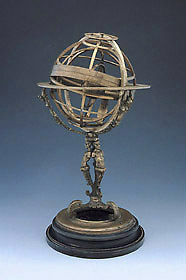 This armillary sphere has circles for the sun and the moon within the customary celestial sphere, and then a geographical sphere for the earth at the centre. One curious feature is a very obvious mistake in the positioning of the zodiacal band representing the annual path of the sun on the celestial sphere. Aries, instead of being at the spring equinox, is at the summer solstice in the position that should be occupied by Cancer. Although the signs follow in their proper order, each is displaced by 90 degrees. From the engraving, the band appears to be original. Although there have been a number of repairs to this instrument, the error does has not been introduced in reassembling the rings, as the positions of the holes in the zodiacal band do not allow it to be fitted correctly.